Guess what may or may not have been purchased by me today? I texted Jon while at the store and told him I needed it and now wanted to completely re-do the living room. His response, "Are you insane?" My response back, " No, just a decorator." We are picking it up on Saturday. Smart man that husband of mine is. LOVE the print :) Can't wait to see how the room turns out once it is added! Oooh! I agree, such a great print, and it looks like it's a great shape too! Wow! So fun! Your first post this morning (about printed sofas) was quite a lead-in!! 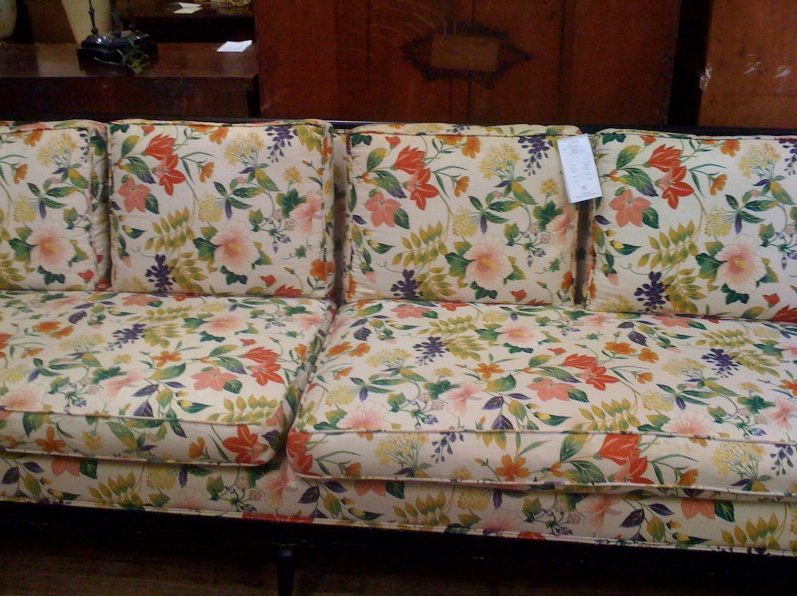 Can't wait to see the sofa in your house! Thanks ladies. It's stunning. It's in perfect condition and in framed in wood that is painted high gloss blank..heaven! I also found two other finds that I added to be bill. I will take pictures on Saturday. I have no idea where they are going to go. I keep pushing Jon for a store front! Ah if only that pesky thing called money didn't keep messing up my plans. Jon literally thought I had lost my mind. I finally calmed down about repainting and leaving things as is..for now, but I needed to rescue that sofa. Great find. I hope you can add it to your home or a clients! A storefront would be fab... I can totally see you thriving with that but you'd have to have one online too since I am in california and don't make it to NY as much as I'd like. So awesome! 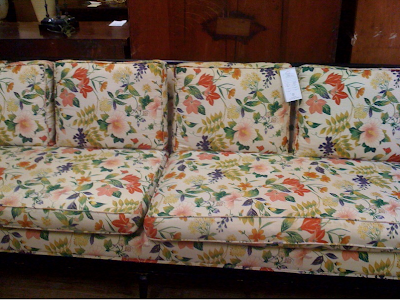 I'm going to look at a sweet vintage couch I found on Craig this weekend, fingers crossed! Are you going to reupholster it? Thanks guys! I totally want to leave the fabric as is. It's bold and beautiful and in perfect condition. Jon on the other hand loves the lines of the piece, but wants it recovered. We don't even have a place to use it yet in our home so we'll have to wait and see what we do. love the sofa, cant wait to see what you do with it! ps just found your blog and love it!! I'm with you on the insane thing - my husband says this to me all the time!